Geneva, 11 June 2017: The first ever and widely hailed UN Ocean Conference wrapped up last Friday at the United Nations Headquarters, with over 1,300 voluntary commitments for further actions registered, including that of CITES to assist its Parties in implementing the Convention for marine species, and the adoption of Our Ocean, Our future: Call for Action. It also concluded the two-weeks of active engagement by the CITES Secretariat to support the protection of the world’s oceans and marine species, stretching from the Atlantic to the Pacific Oceans. CITES Secretary-General John Scanlon joined the Hon. Prime Minister of Fiji Rear Admiral J.V. Bainimarama at the culturally significant ceremony of the repatriation of tabua from New Zealand to Fiji, after which he opened the CITES Oceanian regional training workshop with Hon. Osea Naiqamu, Minister of Forests of Fiji. The workshop was supported by CITES staff. 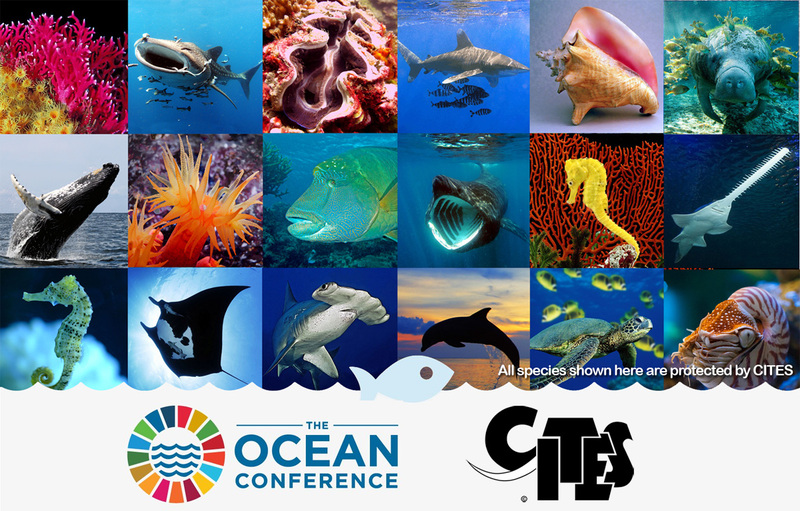 CITES staff also participated in the UN Ocean Conference in New York, including through co-organizing three side events. During the UN Ocean Conference, CITES teamed up with Switzerland and UNECE in organizing a side event titled “Traceability for fish and seafood in supply chains” to highlight the importance of traceability in seafood supply chains and the role of internationally agreed standards such as FLUX in implementing traceability. CITES presentation laid out the legally binding framework and provisions set by the Convention for species listed in the Appendices, including assessment of legality and sustainability, the discussion under CITES how traceability can help document compliance in that regard and how it ties in with the larger debate on traceability. Other speakers included FLUX experts from UN/CEFACT, and GS1. The side event “Supporting recovery of fisheries through cooperation on threatened species and implementation of trade measures”, co-organised by CITES and FAO, showcased the major progress that has been made in the collaboration between the environmental and fisheries communities against the historic perspective delivered by Dr. Serge Garcia, Chair of the IUCN Fisheries Expert Group. CITES presentation focused on how joint projects between FAO, RFMOs and CITES, made possible through the financial support of the European Union, are assisting Parties in making their fisheries more sustainable. Further presentations by Dr. Kim Friedman, Senior Fisheries Support Office at FAO and Mr. Abdellah Srour, Executive of Secretary of GFCM highlighted their respective organizations crucial work on CITES-listed species. UNCTAD, CAF, CITES and the International Oceans Institute co-organised the side event “Blue BioTrade: Harnessing trade and investment for sustainable use” to reflect on how to adapt the existing BioTrade principles to the marine realm to foster ecologically, socially and economically sustainable biodiversity-based value chains, products and services. The CITES presentation provided some reflections on what to take into account when transferring the principles from terrestrial to marine and highlighted some examples of successful management of species listed under CITES and the potential synergies with Blue BioTrade principles. One of the strong resounding messages from this historic first Ocean Conference is that no country, organization or sector can achieve the goal of a healthy productive ocean, contributing to human well-being, alone. In that spirit, the CITES Secretariat engaged in many productive conversations during the past two weeks across the globe to strengthen existing partnerships and establish new ones and to jointly deliver progress on SDG 14 and its targets. Encouraged by the remarks of several fisheries veterans that both the quality and speed of progress in collaboration between CITES and the fisheries sector have been among the most positive stories during the UN Ocean Conference, CITES remains fully committed to working with its partners to ensure that international trade in CITES-listed marine species is sustainable, legal and traceable.